A Bluetooth technology is a high-speed low-powered wireless module link that is designed to connect phones or other portable equipment together. It is a specification (IEEE 802.15.1) for the use of low power radio communications to link phones, computers and other network devices over short distance without wires. The wireless signals transmitted with Bluetooth module cover short distances, typically up to 30 feet (10 meters). It is achieved by embedded-low-cost transceivers into the devices. It supports on the frequency band of 2.45GHz and can support up to 721kbps along with three voice channels. This frequency band has been set aside by international agreement for the use of industrial, scientific and medical devices (ISM).rd-compatible with 1.0 devices. Bluetooth module can connect up to “eight devices” simultaneously, and each device offers a unique 48 bit address from the IEEE 802 standard with the connections being made point to point or multipoint. The Bluetooth module is a transceiver module constructed with a transmitter and receiver. The Bluetooth module is directly interfaced to the microcontroller of Rx and Tx pins as it doesn’t need any external middle ware devices. The Bluetooth is a half-duplex protocol transmitting and receiving the data, but not at the same time. 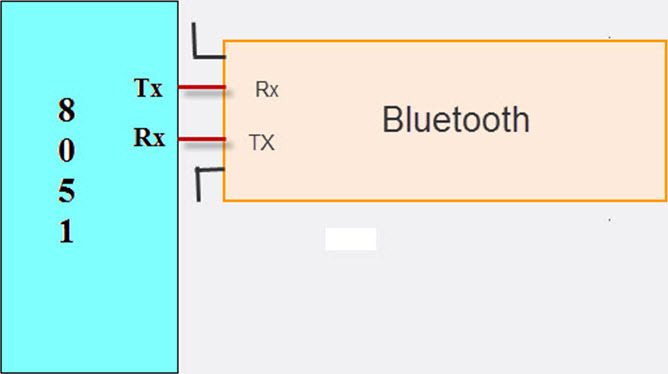 The Bluetooth module is connected to the microcontroller with the Rx and Tx pins as transmitting and receiving the information from the designation. A typical Bluetooth network consists of a Personal Area Network (PAN) or a Piconet containing a minimum of 2 and a maximum of 8 Bluetooth peer devices–usually a single master and up to 7 slaves. A master is the device that initiates communication with other devices. The master device governs the communications link and traffic between itself and the slave devices associated with it. A slave device is the device that responds to the master device. Slave devices are required to synchronize their transmitting and receiving timing with that of the masters. In addition, transmissions by slave devices are governed by the master device (i.e., the master device dictates when a slave device may transmit). Specifically, a slave may only begin its transmissions in a time slot immediately following the time slot in which it was addressed by the master, or in a time slot explicitly reserved for use by the slave device. 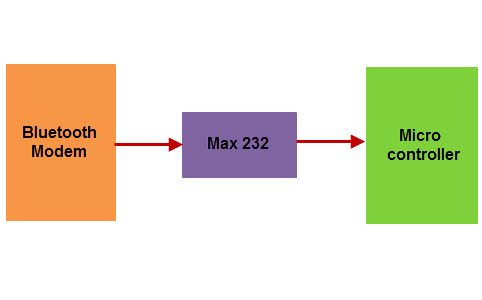 The frequency hopping sequence is defined by the Bluetooth device address (BD_ADDR) of the master device. The master device first sends a radio signal asking for response from the particular slave devices within the range of addresses. The slaves respond and synchronize their hop frequency as well as clock with that of the master device. Scatter nets are created when a device becomes an active member of more than one piconet. Essentially, the adjoining device shares its time slots among the different piconets. For a Bluetooth transmitting and receiving the data programs are given below. Thus, this is all about hoe to interface a bluetooth module with the microcontroller is briefly discussed in the above article.Furthermore, any doubts regarding this article or various wireless communication modules you can approach us by commenting in the comment section below.